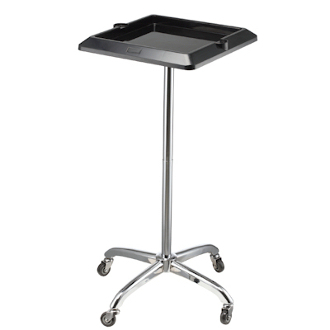 Features full size professional tray that adds a portable working table for color processes, styling, perms and more. Large tray with lip keeps items organized on table for easy access. Made of durable chemical resistant and break resistant material. Cut outs on sides hold tint brush or comb for quick access. Easy glide casters with beautiful polished chrome pedestal. Load up with Service Product and have ready for use. Tools not included.